The BMS 6 is the traditional method for testing Biochemical Oxygen Demand, by using the traditional manometric technique for concentrations of up to 1000 mg/l (ppm); higher concentrations must be diluted before analysis. 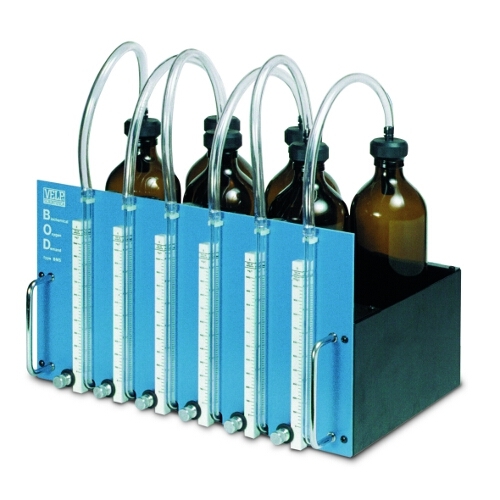 The instrument houses 6 bottles each with manometer and 4 scales for concentrations of up to 90, 250, 600 and 999 ppm BOD. The 500ml bottle can take sample quantities of from 100 to 400 ml. The 6-position magnetic stirrer incorporated in the base of the instrument ensures continuous stirring of the samples. BOD Sensor is the innovative, mercury-free and extremely reliable solution for BOD analysis. Easy to handle, quick and easy to read. A microprocessor-controlled pressure transducer transfers the Biochemical Oxygen Demand value directly to the display: results are displayed directly in mg/l with no need for further calculation and are stored automatically in the BOD Sensor. It fits directly on the bottle containing the sample and automatically stores 5 BOD values at 24-hour intervals meaning that analysis can continue over the weekend. The BOD analysis can be obtained directly from the display at any time, even after five days. Measurement is available on 4 different scales – 90, 250, 600 and 999 ppm BOD. Higher values can be measured by diluting the sample. BOD Sensor Set, a ready-to-use solution for individual BOD analysis only, consisting of a BOD Sensor, a dark glass bottle, an alkali holder and a stirring bar. BOD Sensor System 6, a complete package for 6 tests, consisting of a 6-position stirring station with BOD Sensors, dark glass bottles, alkali holders and stirring bars. BOD Sensor System 10, a complete package for 10 tests, consisting of a 10-position stirring station with BOD Sensors, dark glass bottles, alkali holders and stirring bars. The stirring station is designed for simple handling and ensure the VELP stirring quality. 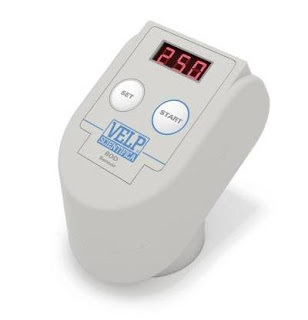 The space saving footprint means that up to 5 stirring stations with 6 positions (30 samples) or 2 stirring stations with 10 positions (20 samples) can be placed in a VELP incubator (FOC 225E or FOC 225I).